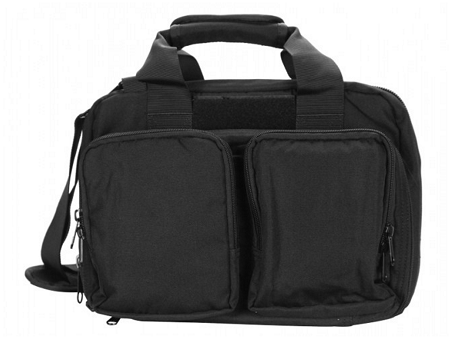 The Mini Pistol Range Bag by Defcon Gear main compartment features two padded sleeves, wide enough that it is capable of holding a full sized service handgun with a moderately sized compensator. The sleeves are held closed by hook and loop style attachment to keep your firearm from moving during travel. The main compartment has a zipper to seal up the bag, a handle that can be fasted for more security, and a removable padded shoulder strap with each end affixed to both sides of the bag so that your bag will never swing open if you should forget to zip it up. On either side of the bag, you have a completely well thought out design that allows you to carry other range gear. One side can carry up to 8 double stack magazines with full extended base plates. The other side has a hook and loop style panel for moral or unit patches, a large pocket with sub-compartment for keys or cell phones, and two smaller pockets for holding any other small essentials you may need.